The main aim for todays walk was Great Calva with a couple of Birkett Fells included en-route and on the way down. The weather was not as bad as forecast but I did spend around an hour in the cloud in the middle of the walk. Cockup on the side of Bakestall. The fells north of Skiddaw. 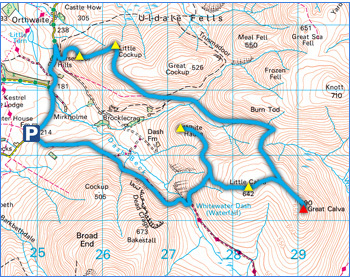 My route takes me around the fell (Burn Tod) you can see in the middle. Burn Tod and White Hause. I will be up White Hause later when Im on the way back. The Edge - the best way up Skiddaw. A wide shot from the start of the ascent up to Orthwaite Bank. Thats Little Tarn just down there. The first time I have noticed it. The summit of Orthwaite Bank. And again, this time with Overwater in the shot and a little bit of Chapelhouse Reservoir. Binsey is lost in the cloud. The next Birkett on todays route is this one ahead; Little Cockup, on the side of Great Cockup. The summit Cairn looking to Overwater. And the other direction looking to the summit of Great Cockup. From here I contoured round the fell and bypassed Great Cockup summit to head down towards Hause Gill. Thats Hause Gill down there with Burn Tod to the left and Little Calva lost in the cloud up to the right. A side on view of White Hause. My path took me up this valley to the hause between the Calva's and Knott. Remaining snow lining the top of the valley. A great little section through a small ravine to the hause. One of the sources of Hause Gill rushing off Burn Tod. The summit cairn on Great Calva. And again with the Wind Shelter behind. Surprisingly there were two other walkers up here. After a wet walk across rather boggy areas I managed to get to the cairn on the summit of Little Calva. No view today. Whilst descending Little Calva and about to turn off to White Hause the clouds lifted for a superb view of Dead Crags. White Hause is the little lump just ahead. Dead Crags as seen from White Hause. A grand view for a fell that is rarely visited. A view across to Meal Fell and Burn Tod from the summit. Great Cockup from White Hause. Burntod Gill heading up towards Meal Fell and Little Sca Fell. A grand view from Dash Falls. An intimidating view to Dead Crags. Whitewater Dash (aka Dash Falls). And a last view following Dead Beck towards White Hause.